With a few cracks on the wicket both sides wanted to bat 1st so it was good that England won the toss, but Australia were adamant to prove that they were able to win either way. After an hours play Cook & Root had done well to defend against Australia’s fighting bowlers. Watson bowled to Root & Australia called for out. The umpire shook his head so Australia reviewed. Hotspot showed that Root got the faintest of touches & was, therefore, caught out for 16. Trott escaped an early defeat as he edged the ball towards the slips & was nearly caught. Luckily the ball didn’t quite carry. Trott continued batting well with the odd heart stopper where he cut it fine with the fielding. Trott’s luck ran out when he caught the ball on his inside edge & was caught by Khawaja. Australia gained control of the game when they dismissed Pieterson, Cook & Bell within a short period of time. Pieterson started his session with a strong, high shot towards the boundary over everyone’s heads. He continued in this fashion, showing impatience with the game. On a more defensive shot Pieterson nicked the ball to Haddin & was caught for 26. Cook was dismissed by a ball from Bird which he chose to leave, unfortunately it turned in on him & made contact with his pad. Screams of LBW filled the air, the umpire agreeed & Cook left the field for 51. Bell was dismissed after Tea by knocking the ball up into the air, for what should have been an easy boundary. But the ball wasn’t struck hard enough & didn’t carry to the boundary, instead Bell was caught by Harris for 6. Bairstow & Prior kept the runs coming although not overly quickly. Australia started to show some frustration. Siddle came in to bowl, there were cries for LBW against Prior. The umpire remained unmoved & Australia reviewed. The decision was overturned & Prior was dismissed for 17. Bairstow continued to plod the game along, having faced 77 balls but was dismissed LBW by Lyon. Bairstow did review it but to no avail as it came down to “umpire’s call”. He left the field for 14. Australian spirits were lifted again when Broad was caught by Warner for 3 after only 15 minutes of play. Swann tried to pull another shot to the boundary but was caught by Lyon for 13. Anderson came onto the field and immediately started to hit boundaries to cheers from the crowd. Bresnan also showed some fighting spirit as he too made a boundary. Anderson brought some much needed energy to the game & finished the 1st days play on a high. The 2nd day started ok but Anderson didn’t seem in the same frame of mind as the night before & was bowled for 16. Broad started the England bowling off with a bang getting Warner after 23 minutes for 3. England’s spirits were lifted higher when Khawaja caught a bottom edge on the ball & was caught by Prior for 0. Several “Oooohs” & “Aaaaaarghs” later after many near misses there were cries of LBW against Rogers. The umpire shook his head & England chose to review. Unfortunately for England it pitched outside leg stump. There were more cries on a following ball against Rogers who was “caught’ by Prior, the umpire called out but Rogers vehemently denied it & called for a review. The review showed he didn’t hit the ball with his bat but his pad & was therefore not out. However, there was a moment of confusion when Hawk Eye showed that he was out LBW by “umpire’s call”. A huge cheer came from the crowd as they saw this but as the umpire hadn’t given Rogers out by LBW but by a catching Rogers couldn’t be deemed out! The game continued & it wasn’t long until England gained another wicket. Clarke was caught off a ball from Broad for 6. Soon after lunch Smith was caught by Prior off a ball by Bresnan for 17. Despite some more near misses Australia started to gain control of the game. Rogers & Watson reached their 50 & 100 partnerships. Frustration started to set in with the England team with several cries of out against Australia but to know avail. Watson gave England a break nicking the ball to Prior who caught him out for 68. Broad absorbed the excitement & started to bowl as though every ball was going to create a fall of wicket. Rogers gained his 1st 100 in an Ashes Test. The umpires came together & decided to take the players off the field. The crowd didn’t agree showing their opinion by booing the umpires but play was called off for the rest of the day. Day 3 started well with some excitement for England when Swann bowled Haddin LBW for 13. Haddin wasted a review checking it. Prior caught Rogers in a spectacular dive, but the umpire shook his head. England used their last review & thankfully hotspot showed that Rogers did catch the ball with his glove. Rogers left the field for 110 to great applause. The next wicket fell quickly, Siddle caught by Cook for 5. Lyon fell not long after for 4, LBW off Anderson’s bowling. England’s frustration of day 2 was being replaced by positive thoughts as Australia began to look like they might not be settling in. After a few poor balls giving Australia vital wickets Broad bowled to Harris & England screamed for LBW. The umpire said “no” but England used their last review to challenge the decision. It was a wise choice as hawk eye showed it to be LBW & Harris was out for 28. Australia all out for 270. Trott started his session well with his usual near misses as well as positive shots. At 42-1 England lead by 1 run. All they had to do was stay in & bat positively to gain as much advantage as possible. No sooner had I thought this, Cook was caught for 22 after nicking the ball to Haddin & Trott was also caught by Haddin for 23! The match rested on Bell & Pieterson as they came out to bat. Could they pull something off & give England the lead they needed? Yes, was thankfully the answer. Shouts for Pieterson LBW came from Australia, the umpire didn’t agree so Australia reviewed. unfortunately for them it was a waste as the ball pitched off leg stump. Unluckily for Pieterson he was caught by Rogers not long after for 44. However, he & Bell reached their 100 partnership having settled in comfortably to score some essential runs. Bairstow looked comfortable hitting some good shots, but the umpires came together & took the players off the field due to bad light. Just before the day was done Bairstow was caught for 28 by Haddin after nicking it slightly. Bell nearly didn’t see his 100 as he hit the ball so close to Clarke, who tried his best to catch him but he couldn’t quite reach. England ended the day with a lead of 202. Bell & Bresnan started day 4. Australia shouted for LBW against Bresnan, but the umpire shook his head. They decide to use their last review but lost it as it came down to “umpire’s call” & Bresnan stayed put. Harris came in to bowl against Bell who edged the ball into his stumps. Bell left the field for 113. Harris made 2-2 when he bowled Prior out for a Golden Duck! Broad changed the tempo of the game when he came out & smashed the ball about to gain some important runs. Harris bowled high to him, Broad was unable to avoid it. The ball hit his gloves & he was caught out for 13. Bresnan took a leaf out of Broad’s book & hit some big shots around the ground too. Swann also picked up the fight & made some great shots to keep the runs coming. Harris bowled to Bresnan who chipped the ball straight back to him & was caught for 45. Great cheers from the crowd were heard when Smith dropped Swann. Every time the ball came to him again during the game the crowd cheered, much to his embarrassment! England’s last wicket fell when Lyon bowled to Anderson who nicked the ball & Haddin caught him for 0. England were all out for 330 giving Australia a total of 299 to beat. Rogers & Warner came out 1st to bat for Australia & were very hard to shift. England screamed for LBW against Rogers but the ball pitched outside leg stump. During the lunch break the heavens opened & play was delayed. Broad’s bowling started to become much more aggressive, showing some more positive thinking from the England team. Rogers continued to prove hard to move as more cries of out were heard when Prior ‘caught’ him & although the umpire agreed Roger’s review proved him not out as the ball had come off his hip. Australia seemed very calm in the game & in no rush. Watson & Rogers reached their 100 partnership having blasted shots about the ground hitting 4s & 6s making the 299 target seem nothing at all! England, however, seemed much more flustered missing several chances to get the batsmen out which added to their frustration. England kept plugging away at the batsmen, eventually catching Rogers at 1st slip for 49. 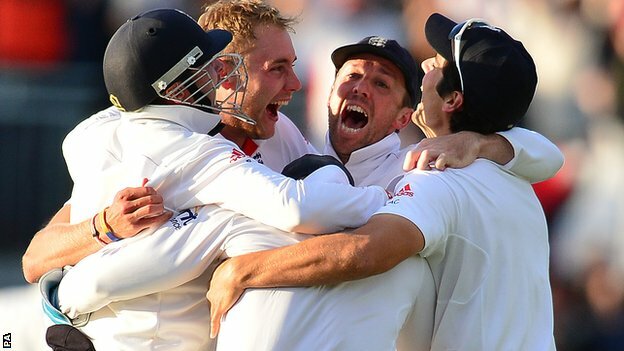 After tea Anderson’s bowling became more aggressive, again showing England’s fighting spirit. Swann bowled Khawaja LBW for 21. Clarke batted next, he & Warner carried on positively. Then Warner was caught by Prior of a bouncer from Bresnan for 71. A big wicket for England which gave renewed hope they could cause Australia to crumble. Shouts of LBW against Smith were heard but the umpire said “no”. England reviewed but all it showed was the ball hitting Smith’s hip. Broad showed more aggression bowling Clarke for 21. Clarke was not happy grimacing as he left the field. Broad was up again bowling to Smith who dragged the ball onto his stumps & was out for 2. Watson was hit across the front of his pad by a ball from Bresnan. The umpire agreed with the shouts for LBW giving it out. Haddin turned to Watson telling him to review, which he did, but it was wasted as it came down to “umpire’s call” & Watson had to walk for 2. Haddin used up the last review after calls against him for LBW were rewarded by the umpire giving him out. The review came down to “umpire’s call” & he had to go for 4. So far England had managed 5 for 13 runs! Broad came in to bowl & was all over it bowling Harris LBW for 11. Bresnan dropped Lyon in the slips. The catch wasn’t difficult but he seemed surprised to see the ball. Perhaps a moment of too much excitement?! Broad made up for this drop catch by bowling Lyon for 8. As the evening drew in Cook requested the extra 1/2 hr he was entitled to (should he think England could wrap it up that night) the umpires came together to check the light all was deemed ok.
A moment of doubt filled the crowd when Prior missed a stumping & 2 catches were fumbled. But Broad came to the rescue again bowling to Siddle who was caught by Anderson for 23. Huge cries & shouts came from the crowd & the England team. They had won the Ashes outright & proved they could do it without any default retaining via draws. Australia – Lyon for his brilliant bowling throughout. Harris for his 7 wickets in the 2nd innings. England – Broad for his 5 wickets in the 1st Innings & 6 wickets in the 2nd. Bell for his 4th 100 in 5 games. This entry was posted in Extracurricular Sport and tagged 2013, Ashes, Australia, Batting, Bob Woolmer, Bob Woolmer Sales, Bowling, Clarke, Cook, Cowan, Cricket, England, Game. The last day of the 4th Test for the who are interested.